InMotion Hosting, one of the most widely-known hosting providers, has been in business since 2001 and has over 300,000 active domains on its servers. On the company’s website, you can read all about its business ratings, performance, support, and hosting infrastructure. But one claim it doesn’t make is how quick it is to sign up for its services. Turns out there’s a good reason for this. Sometimes, you need access to hosting — fast. You want a guarantee that you can have a website up and running within a certain timeframe. So I checked what you can expect from InMotion Hosting by going through registration myself, timing the whole process along the way. 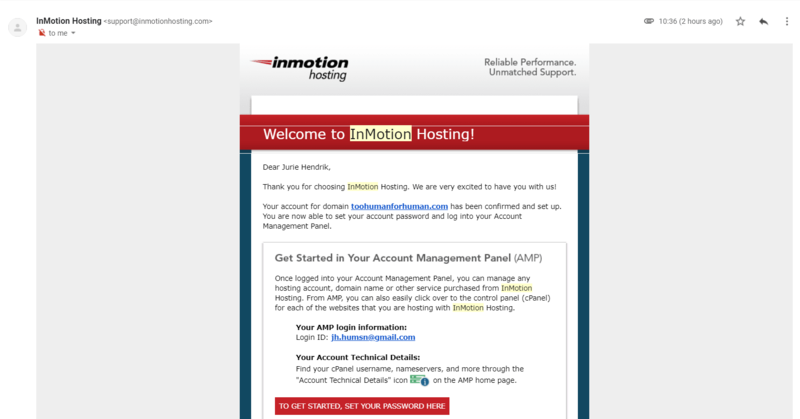 While I was at it, I also thoroughly tested InMotion Hosting’s platform. You can see my findings in this in-depth InMotion Hosting review. 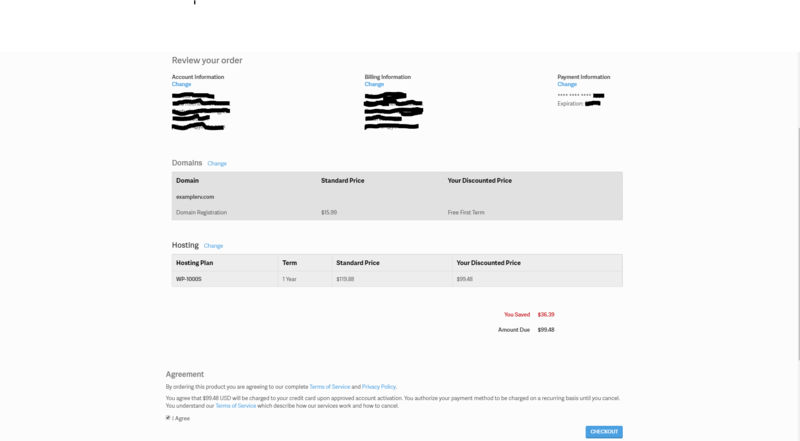 To start, head over to InMotion Hosting’s pricing page. You’ll see that there is a good range of managed WordPress plans available. Keep in mind that the prices you see are for discounted two-year or three-year billing (this can change according to your location). When you move your cursor over the Order Now button, you’ll see boxes pop up for other pricing options. Unfortunately, you can only pay monthly if you choose one of the more expensive plans. At the first step, you can choose the data center you’d like your site hosted in. Don’t worry; this won’t affect the price. You can also change your plan at any time at the top of the page. 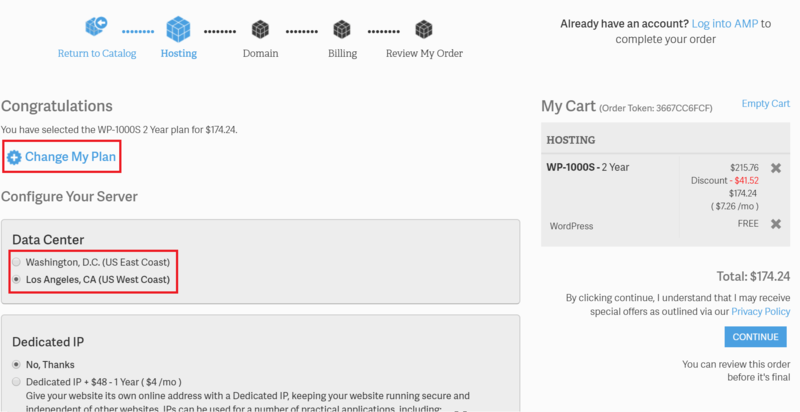 Next, you can purchase a dedicated IP address, order InMotion Hosting’s web design services, or opt to have WordPress or BoldGrid pre-installed for you for free. This is a convenient feature, and installing WordPress yourself through cPanel is not the easiest process, so I recommend you take advantage of it. The dedicated IP and web design services are the only two upsells during the process, and they’re both set to No, Thanks by default. Next up, you’ll need to choose your domain. As all InMotion’s hosting plans come with a free domain, you can add the first one to your cart for free. As soon as you’ve added one, you can immediately add other domains to your cart as well at extra cost. This is where you’ll need to be alert, as Domain Privacy will be automatically added to any domain you add — and at extra cost, as you can see below. InMotion’s domain registration and privacy fees are a bit higher than what registrars would charge, but I still found them pretty reasonable. On the next page, you’ll need to provide your name, country, address, and contact details. Your company name is optional. These fields are pretty standard and nothing you need to worry about. If you were referred by a friend, don’t forget to provide their details at the bottom. If you scroll down, that’s where you’ll provide your payment details. InMotion Hosting only accepts credit or debit card payments or U.S. purchase orders, so this step is very straightforward. Don’t worry about being charged just yet as you’ll still be able to review your order one last time. In the final screen of the registration process, you’ll get a breakdown of your order as well as all your billing and personal details. The You Saved amount refers to whatever promotional offer InMotion Hosting is running at the time. Once you click on Checkout, InMotion will process your payment. Unfortunately, this was only the beginning. For security reasons, all new customers need to go through a verification process that involves a quick phone call with a support agent. You’ll need to wait for this call before your account is activated. InMotion Hosting claims to send a welcome email within a few minutes, and that an agent will call you within 30 minutes. However, this is provided you registered between 8AM – 10PM EST Monday to Friday or 10AM – 6PM Saturday to Sunday. In my case, both the email and the phone call were delayed. But according to other reviews and forums online, almost all other customers seem to be contacted fairly quickly, particularly if they’re from the United States. Even though I ended up calling customer support, this call was very quick and straightforward. I was only asked to give my primary domain to identify myself, and then the last four digits of my credit card for verification. The agent also made sure I understood some of the most important aspects of InMotion Hosting’s services. These include the backup and restore details, important clauses in the Terms and Conditions, and so on. And the third provides instructions on how to set your password so you can log into your AMP. This is the most important email, as you’ll need to click on the button near the bottom to set your password. There will be two documents attached with more information for new customers, such as how to point your domain to InMotion Hosting, set up your email, and transfer your website. I thought these were useful and informative. Setting your password will automatically log you into the AMP. And, finally, you’ll have an active account! One thing’s for sure: InMotion Hosting can’t boast about having the fastest sign-up process. Because of the verification call, the time it takes to actually get your hosting up and running can vary dramatically. My registration took roughly a day. However, in most cases, it should only take about an hour. 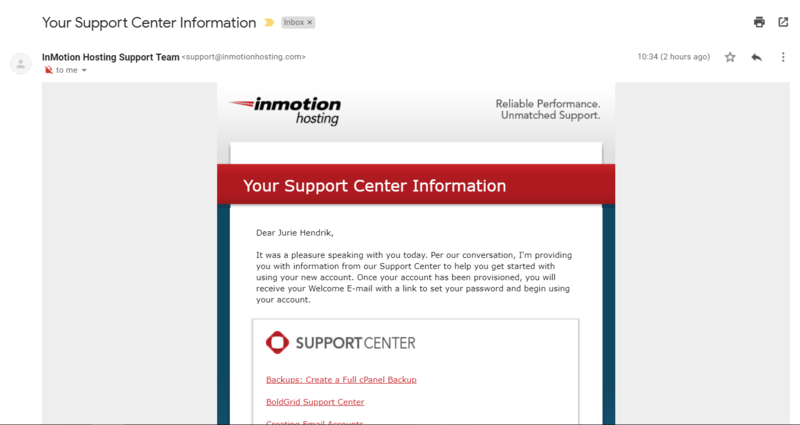 Still, I wouldn’t recommend InMotion Hosting as a fast way to get your hosting up and running. If you look past this one obstacle though, the rest of the sign-up experience is great. It only took a few minutes, there were only two upsells, and the total cost was always clearly displayed without unexpected charges added on later. I think InMotion Hosting could combine a couple of the onboarding emails into one. It was a bit of an information overload for me, but then again, you might appreciate InMotion for going out of its way to help you get started. Still, if you need to get your website up and running quickly and every minute counts, InMotion Hosting probably isn’t the best choice. For this, I’d recommend GoDaddy or Flywheel. 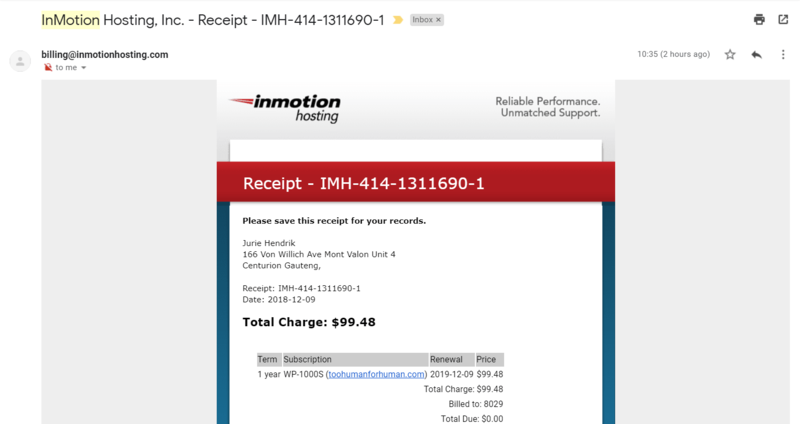 To see what InMotion Hosting has to offer and whether the potentially lengthy sign-up process is worth it, check out my in-depth InMotion Hosting review.